Indonesia and the European Union (EU) has held the ninth meeting of their working group on trade and investment (WGTI) in Brussels, Belgium, to discuss the latest issues in the fields of trade and investment, according to Antara news agency. Antara quoted head of the Indonesian delegation Imam Pambagyo as saying in a written statement that the WGTI had looked into a wide range of technical issues related to the implementation of policies that need special attention from both sides to encourage smooth business and investment. He affirmed that although not all the issues could be resolved, at least the two sides could exchange information to find a common solution. He added that the meeting would support on-going negotiations on the Indonesia-European Union Comprehensive Economic Partnership Agreement (I-EU CEPA). According to Pambagyo, one of the issues that Indonesia raised at the meeting was its palm oil’s access to the EU market. Antara said the EU parliament’s decision to stop the contribution of palm oil-based biofuel in the update of the renewable energy directive (RED Recast) has raised serious concern among and sparked strong reaction from stakeholders in Indonesia. On the occasion, the Indonesian delegation also raised the issue of sanitation and phytosanitary standards that the EU had imposed on various import commodities, such as tea and cocoa. Indonesia and the EU also discussed a proposed policy on the mechanism of selecting investment in EU member states. Meanwhile, the EU raised several issues related to trade and investment policies in Indonesia, such as domestic regulation related to permits to import horticulture and husbandry products, the negative list of investment, and the Indonesian National Standard (SNI). Trade between Indonesia and the EU reached 28.9 billion USD. 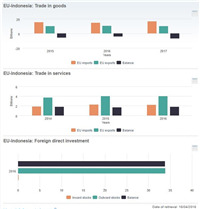 Over the past five years, Indonesia enjoyed a surplus in its trade with EU. Meanwhile, the EU’s investment in Indonesia totals 3.2 billion USD./.